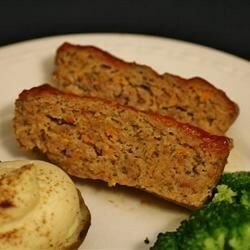 "This no-fail recipe for meatloaf doesn't take long to make and is healthier with lean ground beef, low-fat milk, whole wheat bread crumbs, some fresh parsley, and carrot." Combine beef, egg, onion, milk, bread crumbs, parsley, and carrot in a large bowl. Season with salt and black pepper. Place beef mixture in loaf pan. Stir together brown sugar, mustard, and ketchup in a small bowl. Pour over meatloaf. This recipe is a healthier version of Easy Meatloaf. We did not care for this meat loaf. This meatloaf was great! I replaced the beef with ground turkey, and used almond milk instead of 1% but it came out great!